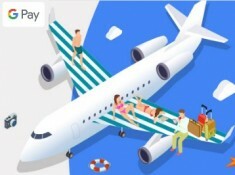 Get the Best deals on Flight during the Everyday Travel sale period. Get Up to Rs.20,000 off on your international flights, Up to Rs.2,500 off on domestic flights. Offer valid till March 31, 2019. . Hurry, make your travel plans now!! Here we at freekaamaal.com Providing all Discount Coupon Codes and offer structure at one place. Offer validity: March 31, 2019. The offer is valid only on online confirmed bookings. Amazon Pay cashback will be credited within 3 working days. Amazon Pay offer can be used for once per customer during the offer period. The PayPal offer will be once per user during the offer period. Customers who have availed PayPal offer in the past Payday Sale ( Feb 27- March 3) will NOT be eligible for this offer. The PayPal cashback voucher will be credited post 4 days of the transaction to customer's Paypal account.